Caption in album by Anne Eby Millar: "Gordon married Elsie Hewitt on June 21, 1921. They raised eight children." The couple's attendants are possibly Wesley Stengel and Annie Hewitt. 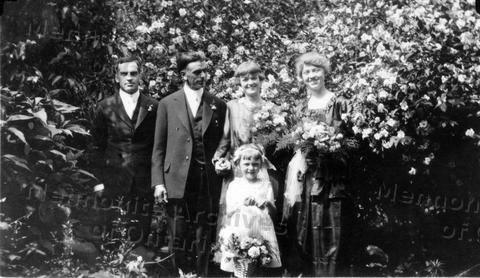 "Ontario Marriages, 1869-1927," database with images, FamilySearch (https://familysearch.org/ark:/61903/1:1:27DN-LQG : accessed 13 June 2016), Gordon Christian Eby and Elsie Maud Hewitt, 21 Jun 1921; citing registration , Kitchener, Waterloo, Ontario, Canada, Archives of Ontario, Toronto; FHL microfilm 2,296,571.